Instructions for how to make goat cheese couldn't be simpler. Within 24 hours or less, you could be enjoying fresh goat cheese with crackers as a snack, or using your creation in one of many delicious goat cheese recipes. My first season of milking goats, I made this cheese several times a week, because it was a great, quick way to use the extra milk that we didn't have room to store. I rarely even had to store the chevre, as we devoured it almost as soon as it was ready! Though I later progressed to making some of the more difficult cheeses with the milk, chevre can't be topped for taste and ease of preparation. 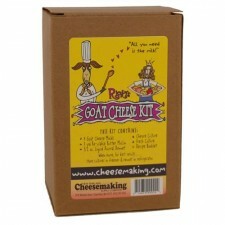 In addition to goat milk, you'll first need to locate a packet of direct set chevre culture. These are small envelopes that contain both the bacterial cultures and a tiny amount of rennet. Most packages come pre-measured for use with 1 gallon of goat milk. They are inexpensive, ranging from $1 to $2 per packet. If you've never made goat cheese before, you may be interested in purchasing a complete Fresh French Goat Cheese Kit from our affiliate, Cultures for Health. The kit provides everything you need to make multiple batches of fresh goat cheese, and, with a kit, you don't have to worry about forgetting something! The use of pasteurized milk is recommended, since this is a soft cheese, and the conditions for making it encourage the growth of bacteria. If you're using your own goat milk, or that from a local farm, and need more information on pasteurizing milk, you can find it in the article, Home Milk Pasteurization. Heat the milk (or cool it in an ice-water bath, if you just pasteurized it) to 86° F. Add the chevre culture, and stir well. Note: A slotted milk skimmer works well for mixing cultures and rennet into milk for cheesemaking. If you plan on making cheeses regularly, you should consider investing in one. Cover the pot and let set at room temperature (at least 72° F) for about 12 hours. Ladle the curds gently into a cheesecloth-lined colander. Tie the corners of the cheesecloth together, and hang over a sink or bowl to drain for 6 to 12 hours, again at room temperature. You can hang the cheese by tying the corners of the cheesecloth around a spoon or stick that sits atop a bowl. I have also left mine in the colander, with a covering, to drain, and it worked fine. Remove the chevre whenever it reaches the consistency desired. A shorter draining time will produce a moister, spreadable cheese, while a longer draining time will produce more of a crumbly, paste-like texture. If desired, add a little kosher, or other non-iodized salt, and herbs. You can find some seasoning ideas for chevre spread in Goat Cheese Appetizer Recipes. Experiment with your own blend of herbs, and create a signature chevre that your friends and family will adore! Articles are updated frequently, so check back here for any new information on how to make goat cheese!